QPR scouting co-ordinator Kevin Cruickshank has tendered his resignation and it is understood head of performance Damian Roden will also leave the Premier League's bottom side. Cruickshank and Roden will meet with chief executive Philip Beard on Monday to finalise their departures. Former Rangers manager Mark Hughes recruited Roden from the Football Association of Wales in February 2012. Hughes brought in ex-Blackburn scout Cruickshank six months later. BBC Sport has learned that Roden tendered his resignation on Tuesday and although it was initially rejected, he reiterated his stance on Friday and is likely to part company with QPR next week. in November and succeeded the next day by who appointed Ian Broomfield as chief scout in January. Broomfield's arrival has seen Cruickshank marginalised, although his departure also relates to an approach by another club. 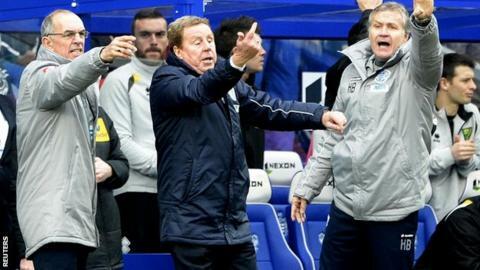 The news comes after press reports claimed QPR's training break in Dubai in February was "more like a stag do". It is understood Roden cited the alleged events of Dubai as the final straw after a gradual dilution of his influence since Hughes's dismissal. QPR's head of media and communications Ian Taylor tweeted: "The club is aware of the article in the Daily Mirror. We will be making no further comment at this time." Other Hughes appointments to depart recently were senior scouts Stuart Webber and Hans Gillhaus. Both came in last summer, Webber from Liverpool and Gillhaus from Chelsea. Webber has since taken over as at Wolves. Technical director Mike Rigg left Loftus Road in December.